Texting and emailing have diminished the popularity of the postcard as a way of staying in touch while traveling. But predictions of its demise are premature. Top-selling post cards still are popular, not least because they offer sender anonymity. In Norway, the best seller postcard by far is Seterjentens fridag (Milkmaid’s day off), featuring a black-and-white photo taken in 1932. More than two million have been sold. The real-life story of Seterjentens fridag reflects Norwegian folklore. Milkmaid Anne Skår (1913–1991) was born at Borgund in Lærdal in Sogn og Fjordane County. At age 12, she began assisting at a summer pasture farm. At age 19, she was a qualified milkmaid working one at Galdestølen, on the road in Mørkedalen on the way up to the Hemsedal massif. The work was hard, the days long and the pay low, just NOK 25 ($5.80 at the exchange rate of the time) a month. Like other farms of the time, Galdestølen literally was on the road, which ran between the cowshed on one side and the farmhouse on the other side. One day, a sow kept at the farm stubbornly stood in the middle of the road, refusing to move. 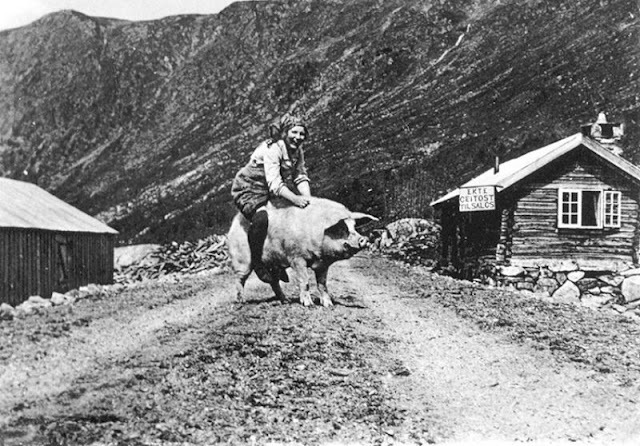 Traffic on the road was negligible, but milkmaid Anne knew that the sow couldn’t just stand there, blocking the road. Persuasive calls and pushing didn’t budge the animal. So Anne tried the ultimate trick of jumping on its back, to ride it like a horse. A tourist staying in a nearby cabin saw and photographed the curious sight of a milkmaid riding a sow. And the rest is history! The Galdestølen farm is now abandoned, but its buildings still stand in Sogn og Fjordane County, just to the southeast of Riksvei 52 (National road 52) between Borlaug on the European E16 highway and Breidstolen to the southeast.